There are times when writing this blog that I find myself at a loss for words. I don't have a fabulous story to go along with my recipes. I can't even come up with a fancy quote to go under the picture, and I'm just too exhausted to Google one. Times when my thoughts are as scattered as the golden flecks of polenta that spilled from my trembling hands onto the black stove top last night. If I could just manage to process them, refine them, maybe even add a little butter and salt, I'd have something amazing to say. But I just can't fit the pieces together. There are times, in fact, when all I have is a recipe. Simple as that. A recipe that's so deceptively easy, yet so luscious, rich and luxurious, that it would be a crime not to share it with you. This roast is fork-tender with a velvety, meaty sauce. And if there's ever a perfect sponge for absorbing a sauce of this caliber it has to be polenta. 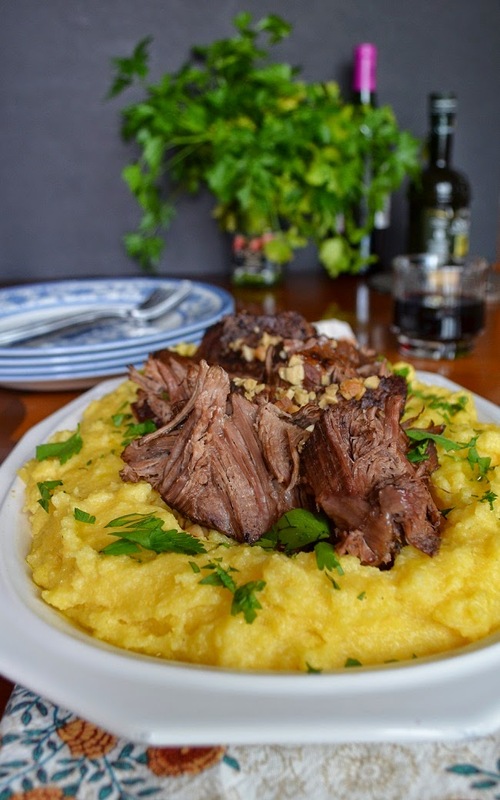 Polenta was made for meat sauce. 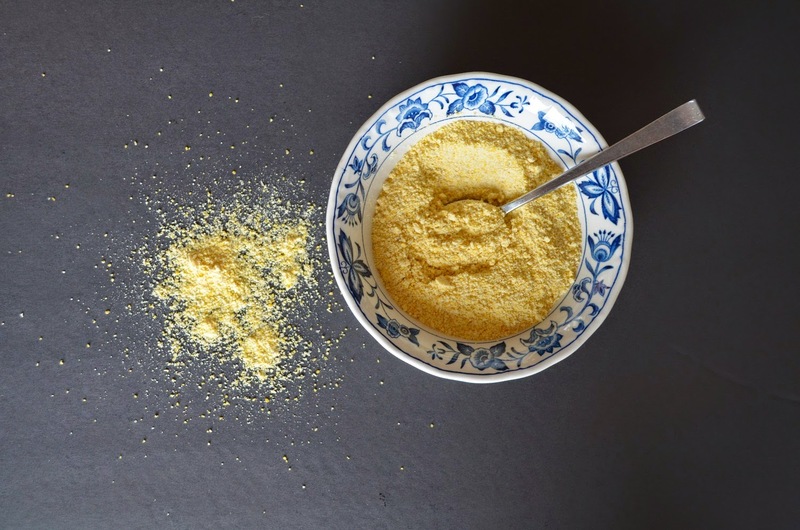 Of course, last night I used instant polenta, which took all of 3 minutes to prepare. Because, as brain-dead as I was, that's about all I could handle. So there you have it. Me being honest with you at 11:30 at night, while my eyelids fight to close, and I'm hitting spell-check one last time. Preheat your slow cooker on high while you prepare the ingredients. Heat the oil in a large skillet. Season the meat with salt and pepper and brown it in the oil on each side. While the meat is browning peel and chop the onion and carrot. Place in the bottom of the slow cooker along with the bay leaves, rosemary, red pepper and a pinch of salt and pepper. When the meat is brown, place it on top of the veggies in the slow cooker. Pour the wine into the skillet and bring to a simmer while scraping the bottom of the pan. Stir in the beef stock, vinegar and honey. Pour over the meat. Sprinkle the minced garlic on top. Cover, turn the heat to low and cook 7 hours (5 hours on high). Just before serving prepare the polenta according to package directions. Stir in 2 Tbsp of butter and good pinch of salt and spread the polenta on a warm platter to create a bed for the meat. 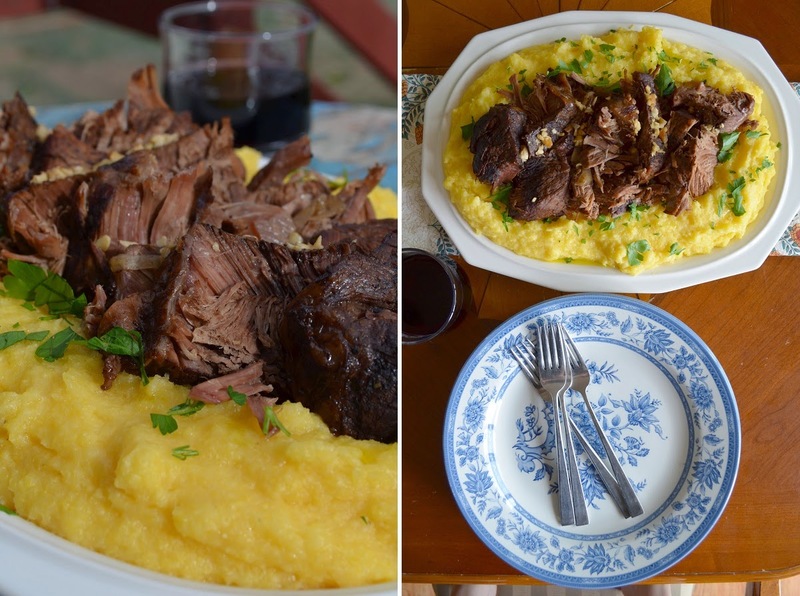 Place the meat on top of the polenta on the platter, and cover to keep warm. Strain the sauce through a mesh sieve into a saucepan. Press all the juice from the veggies into the pan and discard the vegetables. Bring the sauce to a simmer and reduce by about a quarter. Remove from the heat and whisk in the butter. Taste for seasoning and add salt and pepper if needed. Pour the sauce over the sliced meat and polenta and serve the rest in a sauce boat along side. Garnish with chopped flat leaf parsley.